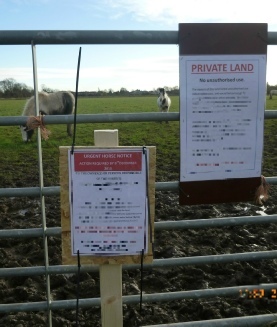 We were contacted by a solicitor working on behalf of a land owner in Leicestershire who had problems with fly grazing horses. The landowner had been approached by a man who asked if he could use the field to graze three horses for a month. The landowner has agreed for a month only as he was going to put his cattle back into the field to graze and asked him for a small fee. The man had put the horses in the field and not paid anything and refused to move them this was 6 months ago and the horses were still there. We attend to execute our instruction under the control of horses act and carried out our risk assessment and served the required notices. After waiting the required time despite contacting the horse owner the horses remained in the field. We then attended and removed the horses to a safe location. Once this was done the owner decided he wanted them back which the landowner agreed providing he paid the expenses. We handled the negotiation and collected the money. We then agreed to deliver the horses back to owner at a neutral location. Having been contacted by a land management agent dealing in rural estates we were asked to help with a problem of 22 horses that had been put into a field to illegally fly graze in Essex. We discussed the issue with the agent and gave a quote which was accepted by the landowner. We attended the site later that day to do a risk assessment and serve notices. The horses were in quite good condition but had been left in the filed without any water. We addressed this served the notices and informed the Police we had detained them. We also made local enquires about the ownership of the horses and found that they belonged to family living a few miles away. We attended this address and spoke with the owners within 2 days the horses had been moved and we had a happy client for horse eviction in Essex. 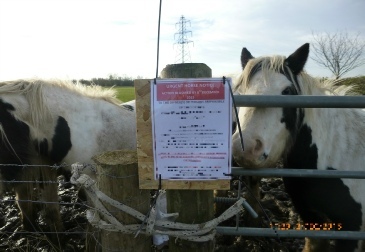 We received an email from a local authority in London that we provide specialist bailiff services for to ask that we seize and detain two horses that had been tethered on the edge of an industrial estate. The horses were illegally fly grazing. We attended the following day with a horse transporter and removed the horses to a safe location. The horses were in very poor condition and they were not claimed. We then spent several hours on the telephone until we were able to find a new home with a horse charity who took them on. Our company often specialise in the removal of horses from land for local authorities. 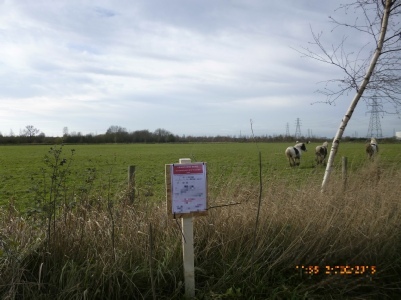 One of the UK’s leading retail chains was having an issue at a site in Wigan with 6 fly grazing horses around the verges on their car park. On two previous occasions some of these horses had got loose and caused mayhem in the stores car park. We attended the same day to do a risk assessment and serve notices but one of the horses a young foal was seriously ill and had untreated wounds. 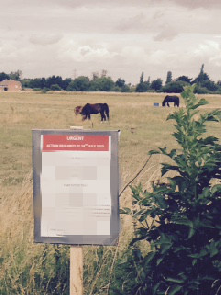 After speaking with our client it was agreed we would remove these horses immediately to a place of safety. A horse transporter was called and they were removed. The ill horse was treated by a vet as transpired it had been hit by a vehicle. The RSPCA was informed of poor treatment of these animals and they helped rehome them. This was another successful eviction of horses by horse bailiffs in greater Manchester.